A small selection of merchandise for 'Castrum Nigra'. 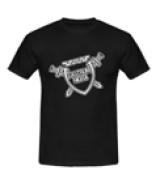 Black shirts in different sizes, white printed. 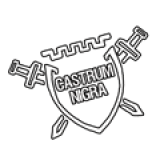 Black ribbons embroidered with logo and title of Castrum Nigra, closed by a one-time-lock. Small round buttons with needle. Big stickers, maybe for your car, nearly 40cm wide.